Diamine Purple Dream is from the 2017 addition to the 150th Anniversary collection. So far I have really liked the collection, and this is the last one from the collection I need to review. Purple Dream is a medium purple with some shading and a tiny bit of sheen. The ink drops show off just a little bit of gold sheen where the ink pooled. On Moleskine paper, there is a little bit of feathering, some bleeding and high show through. This is not an ink I would recommend for cheap paper. Ink swabs for comparison, left to right (top to bottom for mobile RSS): Diamine Lilac Night, Diamine Purple Dream, and Diamine Grape. Both Lilac Night and Purple Dream are from the 2017 Diamine 150th Anniversary collection, but Lilac Night is more blue-violet, while Purple Dream has a lot more red it in. Purple Dream is a little bit lighter and brighter than Grape. Click here to see the Diamine ink swabs together. Robert Oster Claret, Papier Plume Mardi Gras Indian Purple, and Platinum Lavender Black. Click here to see the purple ink swabs together. 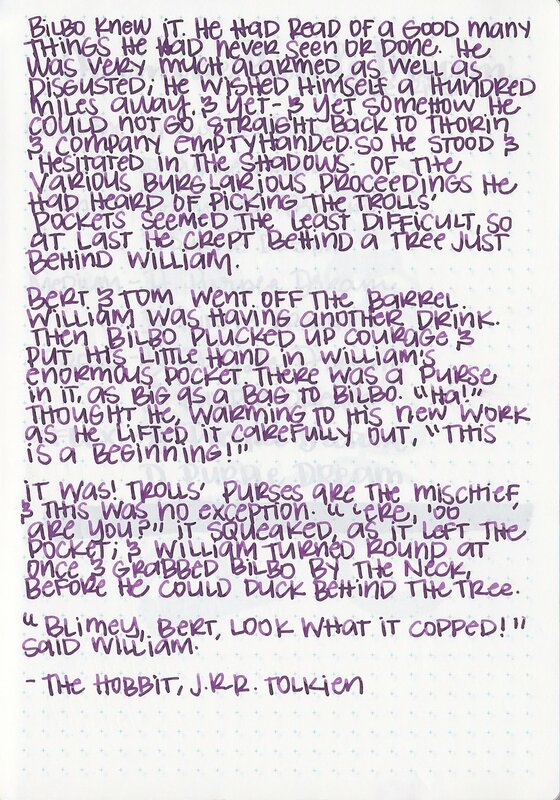 I used a broad Pilot Vanishing Point on Tomoe River paper, and didn't have any flow issues. Overall, I think Purple Dream is a well-behaved ink. It's a pretty color, and the low shading and sheen are nice.